The armored walker in front of Abe was stunned for two rounds. Ramon hit armored walker in front of Curtis with Morgan's staff and managed to stun the one in the middle. After that Curtis fired followed by Abe. So there were two stunned walkers blocking access to Abe but despite of that he went into struggle. 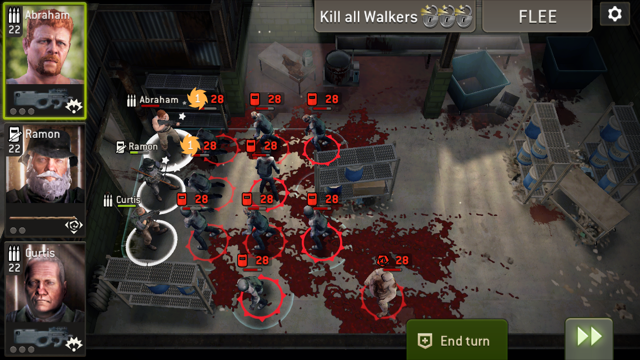 Armor had wrestler and Abe's health bar dropped to red but no walker was killed. Screenshot is from the start of the next round. Scout with silver wrestler was struggling with lvl 29 tank and didn't kill it after the first turn (struggle counter displayed 3). The struggle ended after I had moved my other two survivors at the end of my second turn and she was instantly killed by another walker. The description of wrestler says chance to kill it at the start of your turn, so it shouldn't have happened without being able to move the scout first.